Bin strikers hold up copies of the Birmingham Worker during the strike in 2017. Refuse collections in Birmingham could once again grind to a halt over the festive period if members of the Unite union vote to strike. If it goes ahead, they could walk out from 28 December. 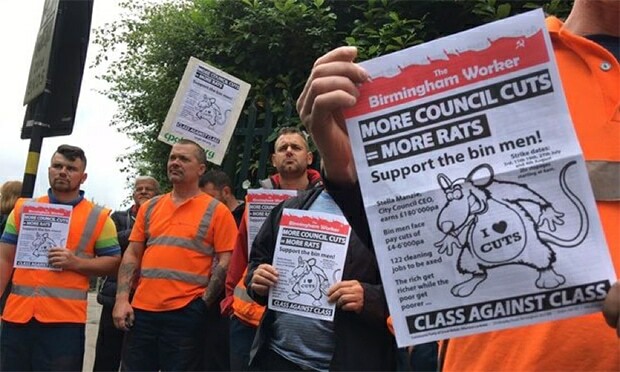 The fresh row comes amid frustration over broken promises to workers and revelations of payments made by Birmingham city council to refuse workers in the GMB union. 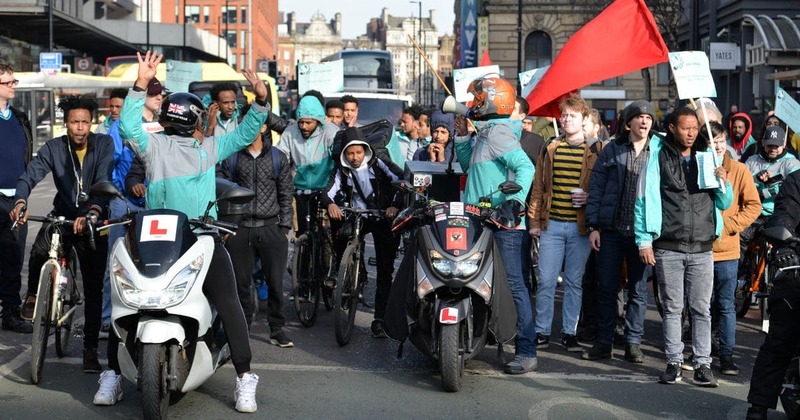 Members of the GMB union did not take part in the long-running strikes by binmen organised in the union Unite last summer. “The residents of Birmingham should be aware that the last thing Unite members want to do is disrupt bin collections over Christmas,” he added. Ballot papers were sent out to members on 30 November. The CPGB-ML’s Birmingham branch gave its full support to the refuse workers throughout their 2017 strike. Together with the binmen our comrades distributed 15,000 leaflets explaining the reasons for the strike, which was over jobs, pay and conditions for workers, and also about public safety. These attacks on pay, conditions of work and the safety of the public were packaged as ‘modernisation’ by the council. Deeply concerned with the welfare of the public and mindful of their duty to the young workers who come into the trade, bin workers were staunch in their defence of hard-won rights. 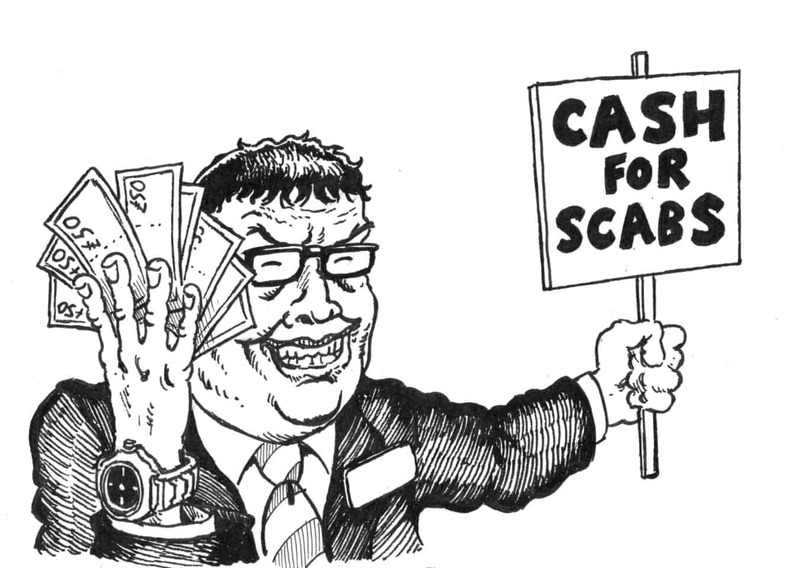 Alongside our comrades, they also challenged local councillors, who criminally squandered £6 million of public money – money that could have been spent on child services, looking after the elderly and ameliorating the worst effects of poverty in Birmingham – in an attempt to break the strike and make a saving of a mere £300,000. The workers negotiated a return to work last November at the insistence of their trade union representatives. The job grades in dispute were saved, but the men agreed to work an extra 50 days a year with no extra pay. Despite their willingness to negotiate and compromise, the bin workers have been treated appallingly by Labour councillors hellbent on driving through cuts to services. Last year’s agreement left a bitter taste in the mouth, but the council, unsatisfied with the result, has broken the promises it made to workers and taxpayers. Now thousands of bin collections are being missed because of Birmingham council’s ineptitude and refusal to listen to the people who deliver the service. The escalating problem was discussed at a recent mass meeting of Unite members at the Birmingham and Midland Institute. Having lied to workers and the public last year during the bin dispute, the council has again double-crossed its employees. In bringing the dispute to an end last year, a memorandum of understanding (MOU) between the council and the workforce was agreed. Measures set out included a new five-day work pattern, an undertaking to employ the dozens of agency workers on proper contracts, and an assurance that every general bin wagon would have a full-time driver, a waste reduction collection officer (WRCO) and a loader. These roles are graded 4, 3 and 2 respectively, based upon their level of responsibility. Pleading poverty, however, the council has failed to employ the new full-time staff that were agreed to last year. Casual agency workers should also have had contracts by now, but the council is stalling, one can but assume, as punishment for strike action last year. Hundreds of roads are having their collections missed as a result of the new five-day pattern. On a single Monday in November, 170 roads were left with rubbish on the street. The council has failed to plan the refuse service properly, resulting in thousands of missed collections. Meanwhile, it is refusing overtime to council staff to clean up the littered roads and is instead trying to pay agency labour to cover its tracks, blaming the whole saga on ‘lazy’ bin workers, who it claims are not doing their bit. This would be the same workers who in 2017 agreed to work an extra 50 days a year for no extra pay – something one could not imagine the city’s parasitic councillors agreeing to do. 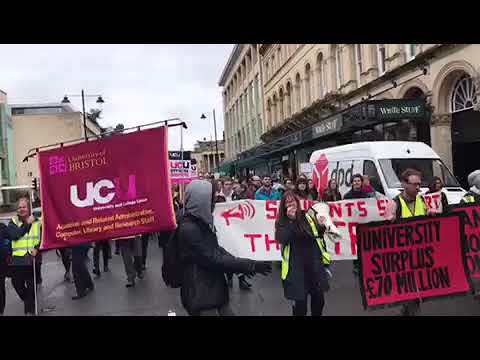 Although it claims to have run out of funds, the council has paid sums of £4,600 (and more) to workers who didn’t strike, and has allowed members of other unions to continue to work a four-day week. This is the shift pattern that was under dispute last year, consisting of four long workdays rather than five shorter ones – a shift pattern that the council claimed must be abolished in order to ‘modernise’ (read, make the workforce cheaper and more flexible’). It is quite clear that Birmingham city council thinks it can divide some, bribe others and turn its back on every agreement it makes with workers and their trade unions. Last year the council squandered millions on confidential payments to private refuse firms during the strike. Somebody got very rich, very quick. The council claims it has no money for essential services, is cutting nurseries and attacking care workers, who have also fought back with strike action, yet councillors have found hundreds of thousands of pounds to spend on the new Birmingham wholesale market, which was built as a joint investment with private finance in Perry Barr. And, having built it badly, the council has gone on to spend hundreds of thousands in rectification works. Elsewhere, it has introduced car parking charges at public parks and recreation areas, pricing out many ordinary families, while in the service of big business its rates department harasses small cafe owners in search of rent increases. Councils all over the country are under huge pressure as a result of austerity-driven cuts to their budgets, and are being forced to make cutbacks as a result. It is telling, however to see where those cuts are made – measures to help big business always seem to take precedence over measures to alleviate the lot of the poor. Huge sums are still being squandered on vanity projects like the wholesale market while the relatively small amounts needed to keep vital services running are impossible to scrape together. Councillors are acting like gangsters, pimping for big business interests, and clearly believe that their two-faced tactics will be enough to beat the binmen. The binmen and Birmingham residents have to say together that enough is enough! When the binmen went up against the council last year, it was in defence of terms and conditions. The workers had to fight a Labour council, every bit as bad and as anti-working class as any Tory council. Unions try to prevent strikes against Labour councils; they prefer to make deals with them because the union bureaucracies are full of Labour party members. They all share comfy jobs and don’t want to derail the gravy train. Unite’s leaders were desperate for a deal right from the moment assistant general secretary Howard Beckett arrived in the city, and had no faith in the binmen’s chances of victory unless it was declared in court. As a result, they gave away the best part of 50 rest days a year, not only for the grade 3 workers who were in dispute, but also of the grade 4 and grade 2 workers. 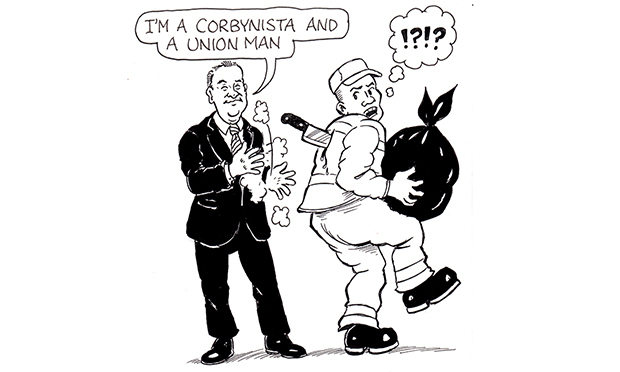 Unite told the binmen that no other deal was possible, but is that true? As we have seen, strike action cost the council over £6m, which, given the current state of its finances, nearly sank it. Unite threw its friends in the Labour council a lifeline by calling off the strike action twice and giving away the rest days of all grades. The proposed action this Christmas will have serious consequences for Birmingham’s residents. The failure of the city council to adhere to previously made agreements, its barefaced lies to the public in 2017, and its blacklisting of agency workers is utterly disgraceful in the 21st century. In contemplating this action, Unite the Union, whatever its past failures, and doubtless under pressure from its militant and angry members, is at present rightly taking a stand against the anti-trade union actions of this employer, and in so doing taking a stand in defence of the rights won by the entire working class to collectively bargain, to withdraw labour, and to face no punitive action for expressing these freedoms.